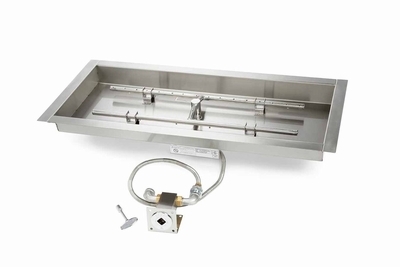 - High quality 30in X 8in Stainless Steel H Burner. - 36X14in ID Rectangular Stainless Steel Bowl Burner Pan with 1.3in lip that provides the base for your pit kit. - Whisper free flex line between valve and burner for easier installation. - Manual Gas key valve with chrome Flange and Key. The H Burner is Made of High quality 1/2" #304 Stainless Steel tubing. Stainless. H Burner has a center hub that is slightly raised to alow for shedding of water as well as gas pressure to be concentrated in center of both outer burners. Also holes are drilled at 30 degrees for an inward flame patern. Start Up: This is done by lighting a long stem lighter next to perimiter of burner then slowly open gas with key valve. Leave key in during use. Operation: Flame height may be adjusted by turning key to valve counterclockwise for up and clockwise for down. Shut Down:To turn OFF the fire pit simply turn key valve clockwise to OFF position and remove key. *Fully Assembled and ready to install. *Flex Line configuration provides versatile and simple installation. *Valve mounting bracket included for safe mounting of control valve. *Flame height is adjustable using key valve. *CSA Certified in US and Canada to ANSI Z21.97-2014/CSA 2.41-2014 requirements. *Optional Install & Controls: Paver Block Bracket, Long Keys. Everything you need for a Match lit Fire Pit! Fire Pit Kit has everything for a do-it-yourself outdoor fire. You can put your fire almost anywhere in your yard including a wood deck, patio or pool deck. That extra touch of class to dress up any yard.